New bike gear to the StoreYourBoard.com site for 2016 are some EVOC bike products that are great for all types of riders, whether you're a veteran of triathalons or a more casual weekend rider. Maybe you're wondering who EVOC is? 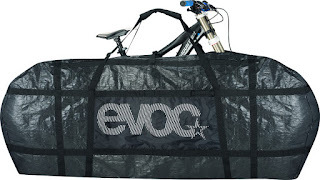 They're an established European ski/snowboard/bike gear manufacturer looking to break into the U.S.
Bike Travel Covers: EVOC has smartly designed 2 different bike covers that are great for keeping your bike protected while traveling. 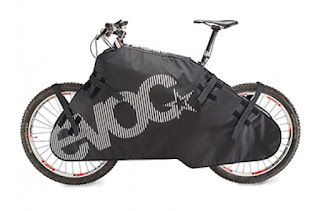 The first is a full Bike Travel Cover, that protects your entire bike frame and wheels. It's made of durable material to handle harsh trips, and is great for loading your bike into your car or bus, or storing it overnight in a hotel or at a friend's while traveling. If your bike is muddy after a tough ride, this cover will keep the mud inside and off your car. The second option is a lower profile Padded Bike Cover. 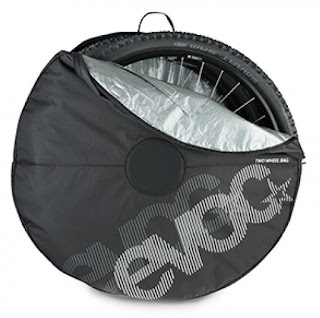 This cover will protect only the core frame of your bike and components, leaving the wheels exposed. Still, its padding makes for great travel protection and the easy on-off velcro attachments tailor to your bike's size. Check them out! 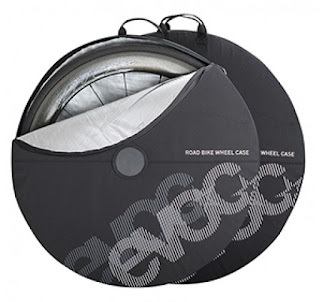 Wheel Transport Cases: Another wise component of your bike travel gear are wheel covers. Once again, EVOC's got 2 different options depending on your needs. For the serious road bike adventurer, there's the Road Bike Travel Cases (set of 2). These 2 cases for your 2 wheels come with padding and axle protection to make sure that your wheels arrive ready to ride. They also fit perfectly in the wheel compartments on EVOC's Bike Travel Bags. Now if you're looking for a more recreational option (or you have a mountain bike) check out the 2 Wheel Travel Bag. This is one bag that fits 2 wheels up to 29". An integrated divider separates the wheels. Both of these bags are great for wheel protection when you're traveling with your wheels removed, or for spare wheels stored in your house or apartment.